The sign of a really good game is when I can’t stop playing to write the review. That’s been my issue with Zombie Match Defense by Shovelware Games. I’ve been playing little else for the last five days and can’t even stop after completing both Normal and Hard campaigns, unlocking all characters, and reaching a high score in endless mode that I didn’t even think was possible . 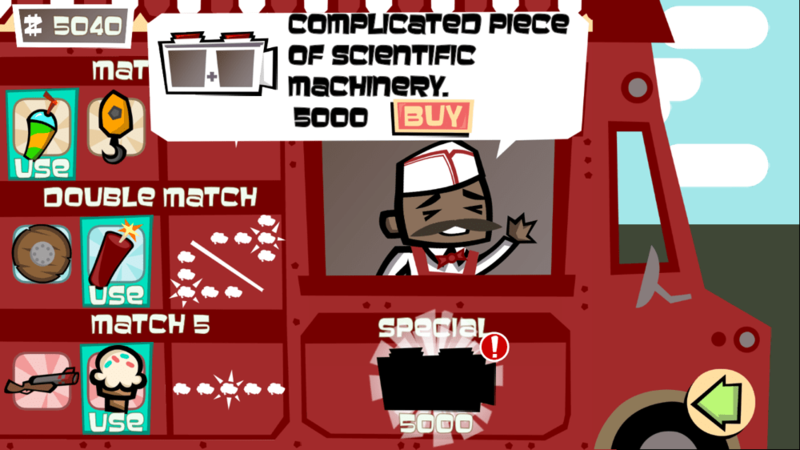 One of the main reasons I’ve been playing so much is that it’s a match-three game with zero in-app purchases (IAPs). This is almost as rare as a unicorn. First, let me give you a little history about the game. If it seems like clichés built upon clichés, that’s for good reason. It was born out of a dare to create a game using a mashup of the two most over-saturated genres in the App Store — tower defense and match-three — that would actually be fun and fresh. Think Plants vs. Zombies meets Bejeweled. And, of course, zombies are more overused than either of those genres. So no one could blame you for dismissing the game based on appearances. But, despite the fact that the game’s name screams “I’m a cliché” and the developer’s name screams “low quality,” Zombie Match Defense is a surprisingly good game. I think the bet was won. If you’ve been following me for a while, you might know that Hero Emblems is one of my favorite iOS games and that I would kill to get an endless arena mode for it. Since I completed all the content, I’ve been looking for something to fill that match-three void — something with depth, that involves strategy and not just luck. Zombie Match Defense doesn’t have quite as much depth as Hero Emblems, but it does have a fair share of it and two different endless modes going for it. The way the game works is you have five lanes of different brains, each ending in a door to the left, guarded by a scientist or professor. The zombies come from the right side and land on a brain. Your task is to swap brains to match three or more of one kind to make them disappear. If a zombie is on one of those brains, he’s killed off with it. If you match brains to the right of the zombie, the zombie will move back a bit to make room for new brains, buying you some more time. The idea is to keep any zombies from getting through a door. If one does, it’s game over. It’s turn-based, so zombies only move after you make a move. There are also four different types of zombies with different behaviors. The normal one is dumb as a doorknob and easy to get rid of. It moves in a straight line and you can move the brain he’s landed on. The Hockey zombie doesn’t always move in a straight line, making him unpredictable. The Sumo zombie can’t be moved by the player. And the Construction zombie has two lives and also stays in place after he loses his first life, instead of moving backwards. The different zombie types will force you to strategize if you want to survive. There are also three different ways to play the game. The first is a level-based campaign that puts you through twenty levels on Normal mode and twenty levels on Hard mode. 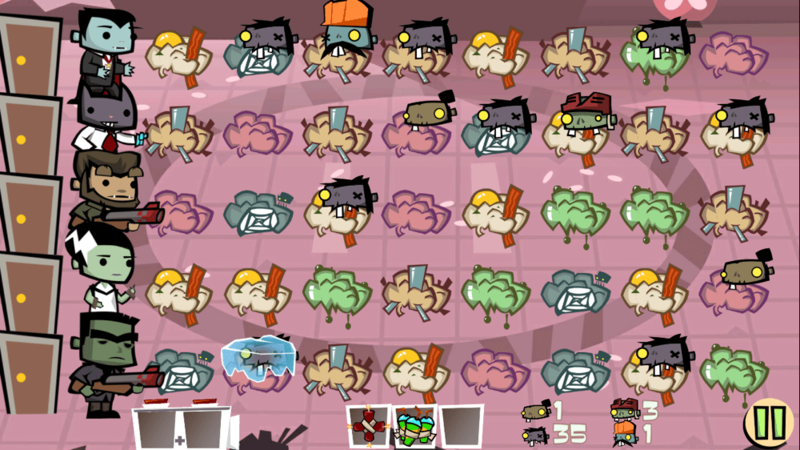 This part of the game has a set number of zombies that you need to defend against in order to complete a level. 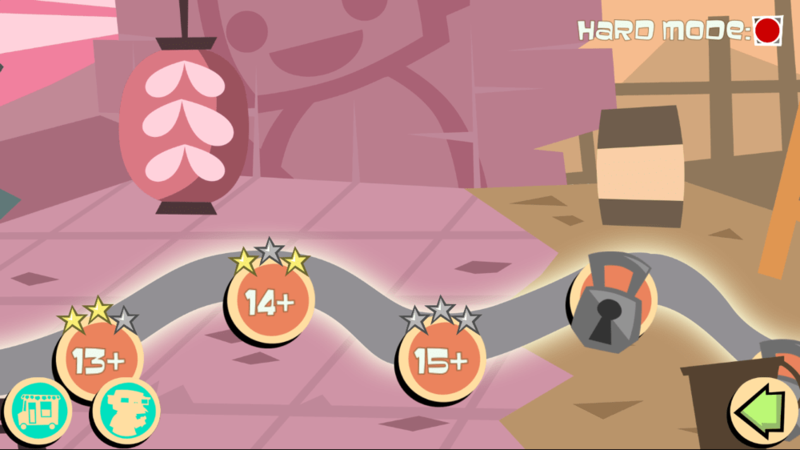 If you do so by only making matches each turn and without losing any professors, you’ll earn three stars. At the moment, stars don’t seem to mean too much, unless you want to challenge yourself. But there doesn’t seem to be a way to show them off. The level-based campaign is also the only way to earn Zombucks, the in-game currency. 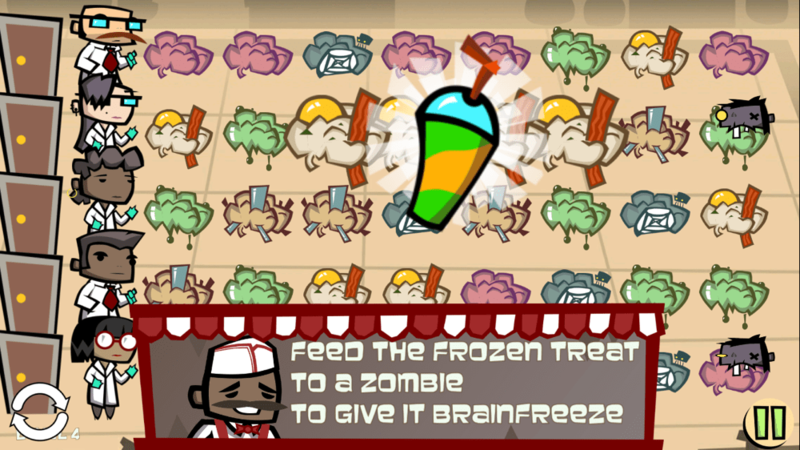 Zombucks are used to purchase power-ups like slurpies — that freeze zombies — and bombs — that destroy zombies — which can then be further upgraded using more Zombucks. There are no IAPs and no ads in the game. The only way to progress is by playing. Furthermore, the power-ups are not temporary boosters that you see in so many match-three games. Instead, they’re more like unlock-able abilities that allow you to earn power-ups by matching four or more brains at a time. I’m really glad they did it this way, as it gives the game more depth. At first, you can only store up to three of these power-ups at once. Later on, you’ll get more slots and a way to combine power-ups to make them more powerful. This is part of the strategy, because if you save them all for later and don’t use any, you won’t have room to take any new ones. You also have to choose between two different power-ups for each type of match before you start a round. The game is often about making tough decisions, and that’s where a lot of its depth comes from. The other two ways to play the game are Infinite, or endless, modes. There are two different versions, each with their own GameCenter leaderboard. The Classic version just throws normal zombies at you and you can’t use any power-ups. It’s the least interesting of the two endless modes, but you can play it almost from the very beginning, and everyone is on an equal footing right away. The other mode, Season 1 (which implies a Season 2 is in the works), includes all zombies, and you can use all the power-ups you’ve earned during the campaign mode. This means that to truly compete for a high score, you’ll need to spend enough time playing through levels to earn Zombucks to get all the power-ups and their upgrades. Otherwise, you’re not entering Infinite mode at your strongest. This was a small gripe for me. As much as I like the game, I find the best part to be the endless mode. The Classic is a bit bland, though, compared to Season 1. So I ended up playing through most of the levels on Normal and Hard until I had everything upgraded. I got turned off from PAC-MAN 256 because of the grinding to earn and upgrade power-ups. I just wanted to improve my skills and compete against others on the same footing — not waste time earning upgrades. I had similar feelings in Zombie Match Defense, even though there are no IAPs or ads. Perhaps if the levels were a bit more interesting — say, if there were bosses or something that set them apart besides the number of zombies you’re fending off — that campaign would have felt like less of a grind. The reason I enjoyed Hero Emblems so much, even without the score chasing, is because it had a huge variety of monsters with different abilities, including tons of bosses. Zombie Match‘s levels start to feel the same after a while, to the point that I was mostly playing them to earn Zombucks for upgrades to use in the Infinite mode. From the very beginning, the endless mode is what pulled me in, but I always felt like I needed to waste time playing the campaign instead. Despite all this, it’s a really solid game. You just have to be willing to put in the time to earn all the upgrades so you stand a chance at competing. And, to be fair, some of the Hard mode levels are quite challenging and took me many tries to complete. So there is some fun to be had there, especially for those who aren’t so concerned with chasing high scores. Besides that, my biggest complaint is that the game is in landscape mode instead of portrait, and I like to play my match-three games with one hand. I know the developer is aware of this and I hope they’ll consider it for an update, along with iCloud capabilities. The game also has a few minor bugs that the developer is aware of and working to fix. But I’ve only encountered them a few times over my hours and hours of playing. They’re by no means game-breaking, but one could potentially give you a bit of a leg up if you encounter it in one of your games. Now that I got the negatives out of the way, I want to mention some more positive aspects of the game. The soundtrack is superb. I turn off the music for most match-three games, or any high-score chasers, really. They tend to get repetitive and grate on my nerves. But the music here is varied enough to keep it interesting. It also fits the vibe perfectly. I’ve been catching myself humming it sometimes. I really did not expect the music to be so good, and it’s an original soundtrack, too! Obadiah Brown-Beach is responsible for it, if you want to check out more of his work. Besides that, the zombies make cute little noises and say things like “you lose” when you, well…lose. The shop owner who sells you your power-ups also announces when you earn a power-up in a match and says fun things like “groovy!” All these nice little touches add a lot of charm to what could otherwise come off as something just too familiar. The game also saves your progress if you close the app down, making it very mobile-friendly. I’ve had rounds that lasted over twenty minutes, so this is a very welcome feature. And since the game is turn-based, it means you can take as much time as you want to think about your next move without worrying about losing your progress. The bottom line is that there’s a really solid game here. While Zombie Match Defense may not have quite as much depth as Hero Emblems (those are some high standards!) it still has more than enough to scratch that itch if you’re looking for a highly strategic match-three game with an endless mode. I had to force myself to stop trying to beat my high scores just so I could write this review. But I wonder if the story mode and Zombucks were really necessary. I think, personally, I would have preferred to just work on my strategy for the Season 1 Infinite mode right from the start instead of having to wait until I had all power-ups and their upgrades. The Classic Infinite mode offers that purity right from the start, but it’s arguably less interesting. Still, I think it’s worth putting in the time to get to the real meat of the game, which you can then play as much as you want without having to worry about any timers or micro transactions getting in the way. If you’re a fan of match-three games but not of IAPs, show some support for games like this so developers know that there’s a demand for them. Download Zombie Match Defense here and try to beat my high score! 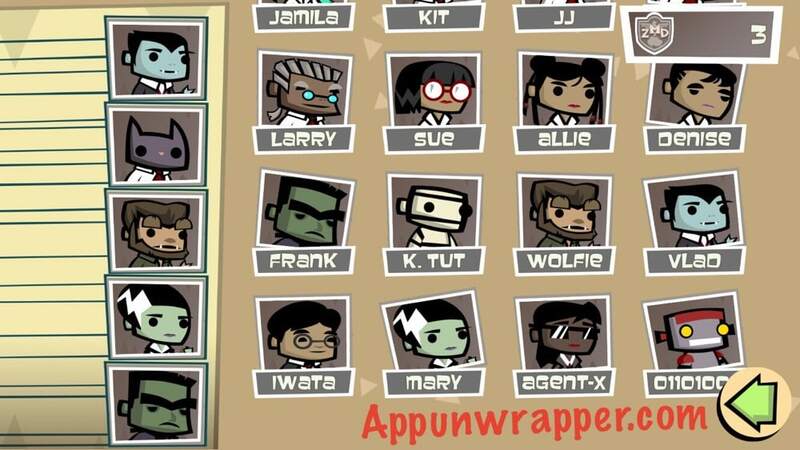 Continue below for some tips and tricks, as well as all the professors you can unlock. 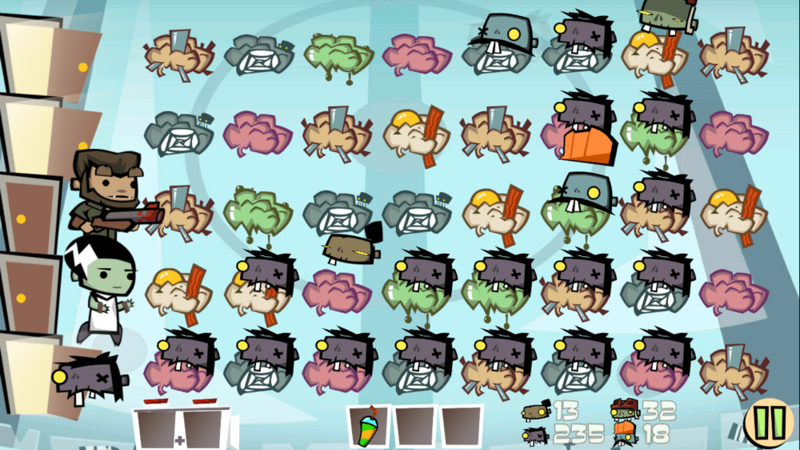 Normal: These zombies move one brain to the left at a time. They can also be moved by the player. They have no special characteristics. Hockey: These zombies move one spot at a time, but they can move at an angle, making them unpredictable. Sumo: These zombies move one brain at a time in a straight line, but they cannot be moved manually by the player. They are, in my opinion, the most annoying of the four. Construction: These zombies wear a hard hat, which gives them extra protection. It means they have two lives, unless there’s no room in the lane for them after the first life. They also stay in place after they lose their first life, instead of moving backwards. Slurpie: The slurpie or slushie freezes a zombie in place for one turn. If you combine it using the Combinator, it can freeze a zombie for up to three turns. Crane: This moves a zombie, along with the brain it’s on, all the way back to the right side. But it also uses up your turn, since it causes the brains to move around. Shield: This can be equipped by one of the professors so they have a bit of extra defense against zombies. It dissolves after one use, but can be combined in the Combinator to have up to three uses. Bomb: Like the slurpie, this can be used at any point and doesn’t use up a turn. It destroys a single zombie of your choosing (or one life of the Construction zombie), while leaving the brain intact. It can be combined in the Combinator to make a three-zombies-in-line bomb or a cross bomb. Shotgun: Like the shield, this can be equipped to a professor. But instead of just shielding them from zombies, it destroys the zombie and then dissolves after one use. It can be combined in the Combinator to last up to three uses. Ice Cream: Like the crane, the ice cream counts as a turn. It changes any brain into a one that can match with any color. It’s very useful, but since it can’t be combined like the others, I choose to use the shotgun instead. Combinator: This can only be bought after you have all the other power-ups unlocked. You then need to upgrade those power-ups to be able to use it. It basically allows you to combine two of the same power-up to make a stronger one. 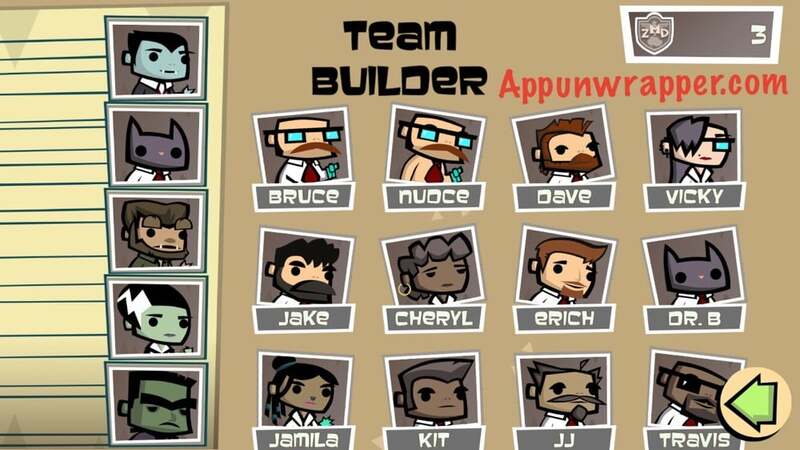 The screenshots below show you all the scientists and professors so you can decided which ones to spend your badges on first. Not available stateside yet – I’ll keep looking! Thanks! !